Are you a busy coach and time is tight? Would you like to get hands on with ready-to-use session templates quickly? Then this book is for you! Minimizing jargon and looking to maximize the limited contact time you have with your players, Soccer Training Blueprints is a must-read practical book for coaches of all levels. 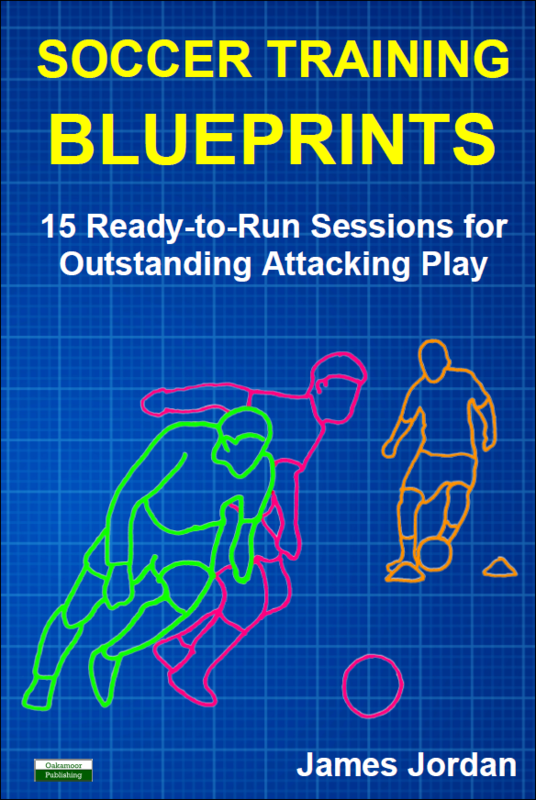 Utilising a game-based approach to soccer – where individuals actually play games rather than growing old in semi-static drills – author James Jordan offers 15 detailed session plans (comprised of 75 cutting-edge exercises) to help coaches develop attacking mindsets and improved skills in their players, and, most of all, nurture a love for soccer. Through his approach, James has won six High School State Championships and one Classic 1 Boys’ Club Championship over the past decade. Aimed at coaches of both young male and female players, from 5-18 years of age, and adaptable depending on age group and skill set, Soccer Training Blueprints combines game-based soccer concepts with contemporary ideas from educational research on training and preparation to develop players who can think for themselves, execute their skills, and work to a plan. This is not about coaches standing on the touchlines yelling at their youngsters – this is about developing footballers to love and play the game as best they can! > A specific topic (e.g., creating opportunities from wide areas). > A detailed overview of the session including instructions on setting up the playing field, what players need to do, and scoring outcomes. > What players will learn from the session. > Coaching points for the session. Please Note: This is the sister book to The Volunteer Soccer Coach. If you already have a copy of that book, please do not purchase this one. James Jordan is an educator and a soccer coach. He holds the NSCAA Premier Diploma, USSF National Youth License, and a Doctorate in Education. Using Game-based Soccer techniques developed over the past decade, his teams (boys and girls) have won six high school state championships and one Classic 1 boys’ club championship. Book Categories: Soccer and Soccer Coaching Books.